Shirts With Random Triangles: Kansas City Royals Supporters Vandalize University Of Kansas Memorial Stadium While Celebrating Team Winning The 2015 World Series. Kansas City Royals Supporters Vandalize University Of Kansas Memorial Stadium While Celebrating Team Winning The 2015 World Series. 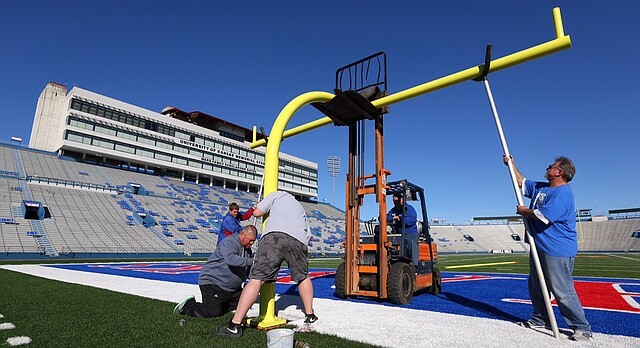 University of Kansas employees repair Memorial Stadium goal post. Image via Lawrence Journal-World. So you're a Kansas City Royals fan in Kansas, and you're team has just won the 2015 World Series. What do you do? Go out and vandalize the University of Kansas Memorial Stadium. That's what. Apparently, some overeager Royals fans in Lawrence, KS. (presumably some of which were University of Kansas students) decided they needed to celebrate their team's first World Series victory since 1985 in the good old-fashioned way - by going out and destroying public property. In this case the property was the University of Kansas' Memorial Stadium. Among other damage, Royals' fans ripped the goal posts down, and carried them off to an area lake. According to The Lawrence Journal-World, Royals fans did around $10,000 dollars in damage to the facility. Besides tearing down the goal posts, the stadium gate was also damaged.